Two weeks before Halloween, Los Angeles artist Aurora Anderson receives an email just as terrifying as the sight of an actual ghost. Her fellow decorative painting chapter member Zelena Alvarez has sent an automatic email to Rory declaring not only that Zelena has a stalker, but that she already may be missing or dead. The missive comes from the appropriately named company Beyond the Grave, which sent out the email after Zelena failed to respond to check-in alerts. A very concerned Rory immediately tracks down the rest of the painting chapter’s members, none of whom admits to seeing Zelena after their last meeting. Rory’s boyfriend, Vista Beach Detective Martin Green, has too much on his plate dealing with the Provocative Pranksters to deal with only a possible missing person, at least not until one of the pranks seems to tie in with jewelry Rory created for Zelena. The news only seems to get worse when a mysterious psychic named Raven Lee brings news of a vision of the missing woman, one that leads Rory to the worst discovery possible. A former child television star, Zelena may have acquired a stalker from her brief time as a celebrity actress or even from merely walking down the street. Feeling beholden to Zelena as a result of her desperate last email, Rory is determined to track down those responsible for making the actress-turned-kindergarten teacher feel threatened. Rory’s best friend Liz Dexter enthusiastically reignites their Dynamic Duo investigating status, becoming the Ethel to Rory’s Lucy when Liz isn’t inundated by her family’s requests to show real estate homes. A freaky child ghost, escalating pranks, and ties to the Hollywood world all contend for the top spots as possible suspects, and that doesn’t even include the egos of those involved in the meeting chapter’s upcoming Halloween charity event. 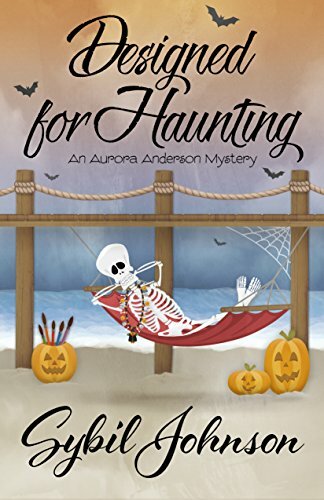 The fun chaotic atmosphere of a California beach town in the midst of a month of Halloween events truly comes alive in this fourth of the series, which has Rory and Liz doing their best to sort out the pranks from the genuine threats. Costume contests, eerie decorations, and even a psychic ensure for a delightfully fun and spooky read. Rory and Martin “Dashing D” Green will have their own obstacles to overcome, especially as she continues to place herself in jeopardy that risk replaying the fate of his late wife. The sympathetic and very determined Rory again proves herself to be a heroine worth following, with her bestie Liz bringing the humor, and Martin delivering the romance. To enter to win a copy of Designed for Haunting, simply email KRL at krlcontests@gmail[dot]com by replacing the [dot] with a period, and with the subject line "haunting,” or comment on this article. A winner will be chosen October 13, 2018. U.S. residents only. If entering via email please include your mailing address (so if you win we can get the book sent right out to you), and if via comment please include your email address. You can read our privacy statement here if you like. This is a new to me series but looks like a great read. I really enjoy Halloeeen themed mysteries. A great Halloween themed book. Can’t wait to read. The plot sounds like a real page turner. Another new author & series for me. If it even comes close to Lucy & Ethel's hijinks it ought to be good. Thanks for introducing me to all these new series & for the giveaway. Sounds like a great Halloween read. New author to me. Would really like to read. This sounds sooooooo good! Love the cover.